During the last days, Panama City has been a different place: It was Carnival, and the entire city celebrated it. The first sign we noticed on Friday was the closure of a major downtown road, Avenida Balboa, which runs along the coast. Part of this road, and the Cinta Costera coastal park next to it were the main area for the celebrations, with daily parades, four stages where music and show acts were hosted, and a multitude of little stalls selling food, beverages, souvenirs and toys. On Saturday morning, the entire city seemed deserted. The usually busy roads were empty, restaurants were closed, and even the bustling Casco Viejo with its souvenir stores, restoration projects and tourist activity was empty and quiet. As soon as we reached Cinta Costera we knew why: live music was playing on several stages while big water tanks stood by to spray the dancing crowds with water, a very welcome refreshment in the hot noon sun. Soaked with water, hungry and excited, we retreated home during the late afternoon to get changed and rest, before joining the celebrations again in the evening. The atmosphere was like a big street festival, and it seemed that the entire city had come out to participate in the festivities: from old men in Wheelchairs to babies in the arms of their parents, from Kuna women in their traditional Mola to Tourists in their not-quite-so traditional flower print shorts, everyone was there. We strolled through the crowds, considered buying funny sunglasses and flashing hair ornaments, tried grilled Chorizo and marinated pork on skewers, and listened to the rhythms of Salsa, Rumba and Reggae being played everywhere. Children darted through the crowds, spraying unsuspecting people with fake snow, couples young and old danced by the stages, while the carnival queens waved serenely from their decorated wagons. Each evening brought new parades with elaborate floats, stunning carnival queens and animated calypso bands, we could not get enough of the multitude of things to see, the flavors, smells and sounds of a whole city dancing and celebrating together. The whole thing had a strong feeling of community, an openness that large cities usually do not experience, people were brought together by the music and the festivities. And then, today, Ash Wednesday, it seems like it was all a dream. The colorful displays, the calypso bands, the queens and dancers and revelers are all gone. The city is returning to normal, until next year, when the next carnival queen will be crowned to lead the city during these exceptional days. Panamanian Reggae, or Reggae in Spanish, which includes not only Reggae Roots, but also Reggaeton, Dancehall and Soca music from Panama, is a popular music genre influenced by Jamaican Reggae, Trinidadian Soca, Haitian music, and various African sounds. One of Panama´s most famous Reggae artists is Kafu Banton, whose real name is Zico Alberto Garibaldo Roberts. Kafu, who is originally from the Caribbean port of Panama, Colon, chose his name as a fusion of Cafu, name of the famous Brazilian soccer player, and Banton, in honor of the Jamaican Reggae artist Buju Banton, who had great impact on the Reggae music industry worldwide. Starting his career in 1989, Kafu´s song “Vamos pa la playa” (2004), as well as his albums “The Best of Me” (2000) and “Vivo en el Ghetto” (2004) are probably his most popular productions reaching also other Central American countries, the United States, Colombia, and Spain. In early high school days, Kafu was a good friend of a family member of Ernesto Brown, known as Apache Ness, one of the best Panamanian Reggae artists, who introduced him to the world of Reggae music. Like most Reggae Dancehall artists, Kafu´s name was spread across the country after various Rap competitions in local clubs. Later on, he was invited to perform at bigger events and from there on he got his career started. 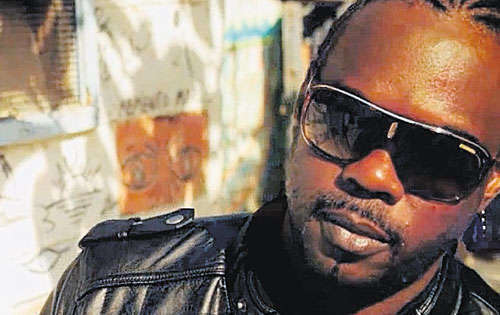 Due to violent lyrics, Kafu was one of the artists censored in what is called the “Era of Double Sense” in Panamanian Reggae. In continuation of this era, he made a drastic turn in his music styles switching over to faster rhythms and plainer lyrics. Nowadays, Kafu predominantly sings Reggae Roots, and lyrics with positive and peaceful messages. Some say this happened due to his change of producers, others say it was his conversion to the Rastafarian religion that made him become a more peaceful person. In 2009, Kafu´s son Sico died of a brain tumor in Colon City; he was only 12 years old. Due to this great loss, Kafu cut off his long Rasta hair that he had been letting grow for 11 years, as well as his beard. His change of appearance was a result of the Rastafarian doctrine saying that the hair needs to be cut off if a person dies close to you, or if you have been close to a dead body. His Rasta locks are stored in Costa Rica, Panama´s neighbor country, in which he had decided to cut his hair off. Over the past years, Kafu Banton has been letting his hair grow again. He has produced various new songs with Latin American artists such as De La Ghetto, or Ivy Queen, and he is still adored across the whole country. Watch out for the Red Devil busses with Kafu´s picture on it when you come visit us in Panama City! Panama is a small tropical country, but it is growing more and more in terms of tourism. Its strategic position makes it possible to drive from one coast to the other in short time, it is bordered by two oceans, and has a connecting position between North and South America. The mix of cultures as for instance indigenous & urban cultures, and the diversity of natural resources are significant advantages. The main objectives of the government are to produce economic and social prosperity through the development of national and international tourism. Because of this, Panama seems like an emergent destination in Central America, which can compete with its neighbor Costa Rica. Luxurious forests, pristine beaches, the diversity of the flora and fauna, and indigenous peoples characterize the country. At Tocumen airport, the number of arrivals in the first trimester of 2012 increased to 19,1% in comparison to 2011. The percentage is constantly rising due to newly created facilities and investments in tourism businesses through the opening of a lot of Convention Centers. But what should tourists do in Panama? The answer is not easy, since there are many things to do and many places to visit. Each experience is unique here and you meet friendly people who can help you during your visit. The most popular destinations are Bocas del Toro Archipelago, Boquete, and San Blas Archipelago; but many other provinces are worth a visit as well. A lot of activities can be practiced, as for instance hiking, scuba diving, horse riding, bird watching, kayaks, rafting or just relax in paradisiacal beaches. Ecotourism is now developing quickly in the whole country. Ecotourism in Panama is a necessity. In order to keep the variety of traditions, the country has to maintain its natural resources and the indigenous cultures and lifestyle. This – I would say – is one of the main touristic attractions, since it makes a great difference to Costa Rica for example. Costa Rica is well developed in ecotourism but indigenous peoples have almost completely disappeared. Moreover, with 950 species of birds, 15 natural protected parks, and 11 000 species of plants, Panama offers exciting possibilities to enjoy your vacation. Partnerships of touristic businesses and local communities are common, and don’t only permit the development of the local economy, but also the maintenance of traditional cultures. The company Ecocircuitos is a part of the economic development of ecotourism due to its ethic values and its involvement in the tours. If you want to help protect Panama´s environment and traditions by travelling sustainably, feel free to contact us !